Archie Manning attended the University of Mississippi and was the starting quarterback at Ole Miss for three years. In his college career, he threw for 4,753 yards and 56 touchdowns and ran for 823.5 yards. He scored 14 touchdowns in 1969. In both 1969 and 1970, he was named to the All-SEC team and his #18 jersey was retired by Ole Miss. In 1969, Manning was Mississippi Sportsman of the Year and recipient of the Nashville Banner Trophy as Most Valuable Player in the Southeastern Conference. He was fourth in the Heisman Trophy voting in 1969 and third in 1970. 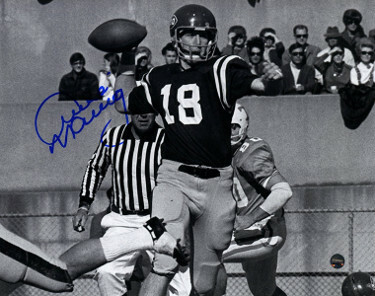 Archie Manning has hand signed this Ole Miss Rebels Vintage B&W 16x20 Photo. Steiner Sports Hologram and Certificate of Authenticity.